The Santa Fe Classic Dehumidifier removes odor-causing moisture and maintains EPA recommended relative humidity levels of 30 to 50% ideal conditions for an odor free storage space or comfortable living space for you and your family. If you store anything of value in your basement or if you use your basement as living space, it is important to keep the moisture levels low. Relative humidity levels rising above 70% stimulate the growth of mold, mildew, bacteria and other biological allergens, which generate musty basement odors. These conditions must also be prevented in microenvironments such as underneath carpeting, rugs, or storage boxes. 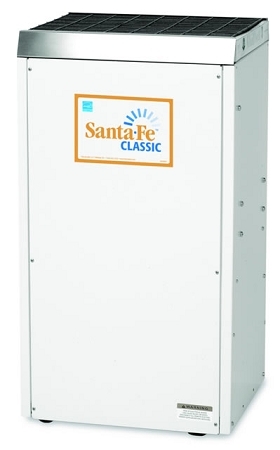 The Santa Fe Classic is the most energy-efficient dehumidifier in the industry and offers time-tested technology to maintain 50% or less relative humidity in your home as recommended by the EPA, American Lung Association, and American Medical Association. Energy Star Listed:Uses only 6.4 amps of electricity offering as much as $275 per year in energy savings compared to the conventional dehumidifier. More pints of water per kilowatt of electricity means lower cost of operation. Temp Operation:Powerful enough to control humidity even in the cooler environments of basements. Dehumidifiers are rated at 80F and 60% relative humidity. At the cooler, real-life temperatures of a basement, the capacity of conventional dehumidifiers drops dramatically. At temperatures below 65F, frost forms on the coils of a conventional unit and causes the unit to ice-up. Frost cuts down on air circulation so the unit does not remove as much moisture from the air. Some units have automatic defrost but remove minimal quantities of water in cooler conditions. However, even at regular basement conditions, the Santa Fe Classic removes more pints of water per day than most dehumidifiers. MERV-11 Filtration:The Santa Fe Classic Series utilizes a blower rather than a propeller fan allowing the use of high-efficiency air filtration for improved indoor air quality. Standard MERV-11 filtration is 65% efficient and captures particles from 1.0 to 3.0 microns in size resulting in effective filtration of most mold spores. Optional Ductability: Attaching ductwork to the unit promotes air circulation throughout the basement, allowing for placement of the dehumidifier in a remote location such as the mechanical room. Operating Temp. : 56°F Min., 95°F Max. Size: 16" x 20" x 2"